How to Copy Blu-ray to MKV with Chapter Markers Well Preserved? Chapter markers are a important feature in Blu-ray/DVD disc. You can add chapter markers to your project so that when you shared your finished movie, viewers can use the markers to quickly jump to those points in the movie when playing the movie on iTunes, iPod, iPhone, iPad, Apple TV, QuickTime Player, DVD Player and most standard DVD and Blu-ray players. Want to watch your favorite Blu-ray movies on devices or media players with chapter markers but have no idea how to achieve that? Never mind, with a right tool in hand, you can easily make that with just a few steps. The program here we recommend to you called Pavtube ByteCopy (best Blu-ray Ripper review), which helps you to backup Blu-ray to lossless multi-track MKV format with all the meta information including Blu-ray chapter structure, subtitle languages and audio tracks (5.1 audio track) well preserved. You will then be able to watch Blu-ray with chapter markers with on chapter markers capable devices and players. Apart from copying Blu-ray to lossless multi-track MKV, you can also use the program to rip Blu-ray to multi-track MP4, MOV which is widely accepted by most devices and program. Tips: The latest version of Pavtube ByteCopy has upgraded with support for MKB62, which helps to bypass encryption, BD+ copy protection and region code from all the recently released Blu-ray movies. How to Rip Blu-ray to MKV with Chapter Markers? Insert Blu-ray disc into an external Blu-ray disc drive, launch ByteCopy, and browse to disc drive for importing your Blu-ray movie into this app. 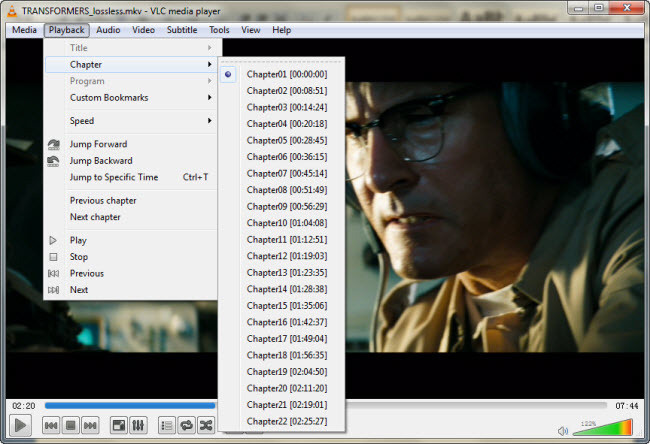 Step 2: Output Blu-ray to MKV with chapter marker. 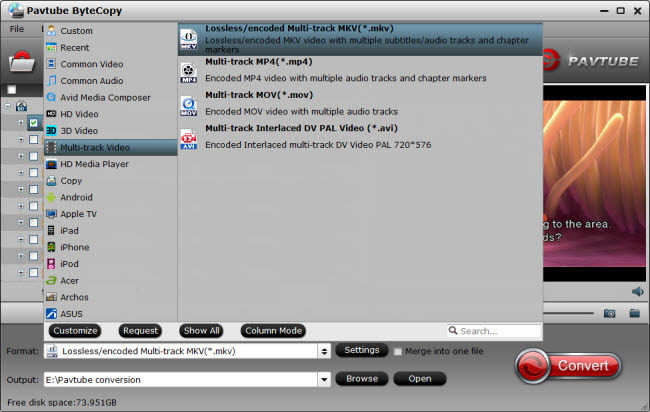 From “Format” bar drop-down option, navigate to “Multi-track Video” main category, from its extended options, select “Lossless/encoded Multi-track MKV(*.mkv)” as the desired output format, which helps to keep the original chapter structure of the Blu-ray disc. Step 3: Adjust multi-task settings. 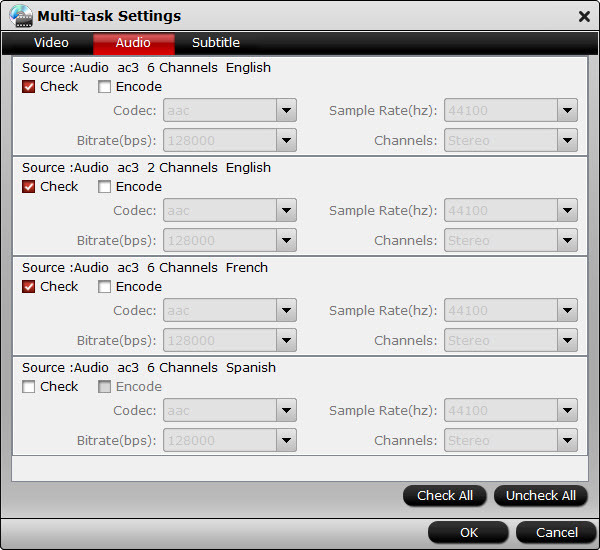 Click “Settings” to open “Multi-trask Settings” window, you can uncheck unwanted audio or subtitle tracks so that they won’t be saved in the output MKV file. After all setting is completed, hit right-bottom “Convert” button to begin the conversion from Blu-ray to MKV format with chapter markers well preserved. When the conversion is completed, add the converted MKV files with chapter-marker to the devices or players for viewing with chapter marker features. Who is The Best DVD Ripper: WinxDVD or Pavtube?